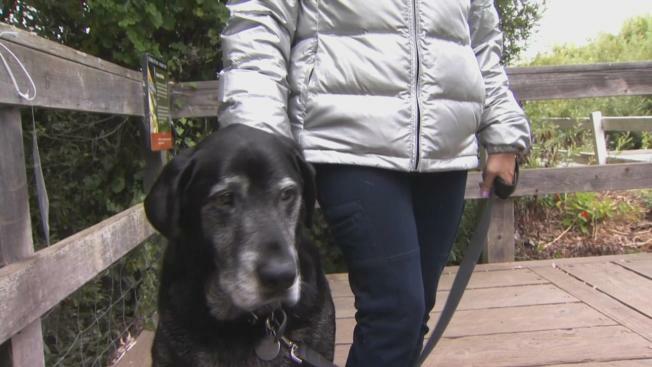 Dog owners in Pacifica were on edge Thursday, a day after one woman encountered a man with a knife who she said threatened to stab her 11-year-old black Labrador. The woman, who didn’t want to identify herself, reported the incident to police. She said what the man said to her while she was walking on a hiking trail was chilling. "He said, 'It’s there, so I can stab your dog if he gets anywhere near me," the woman recalled. "I felt threatened for my dog, for me and other folks around." She took photos of the man and his knife and gave them to Pacifica police. The trail near Mori Point has leash laws, and people aren't accustomed to such confrontations. "That’s the first I’ve heard of this," dog owner Rick Dealba said. "This is usually safe for pets and people." "I think it’s just awful," Ryan Arroyo said. "I come here all the time, and it’s off-putting." The police report included a statement that the man "doesn’t look like he was in his right mind." Hikers say police should investigate further. "I think if he were attacked, he could defend himself," Jen Nevels said of the man. "But to threaten? No, he doesn’t have the right to do that." Dog owners recalled a dog being stabbed in Pacifica two months ago, but police did not confirm that incident.